I setup home assistant around sixÂ months ago, and I have amassed a sqlite database around 700Mb. Today, the entire six months of history is in the Sqlite database which is causing home assistant to hang for minutes when I try to look at history, even if the requested history is only today. For other stuff, I’m happily using MariaDB and I have a beefy server which is much faster than the Raspberry Pi SD Card which hosts my Home Assistant and its sqlite3 database. Â I’m also experimenting with the Google Cloud SQL Database and Amazon Webservice’s RDS. 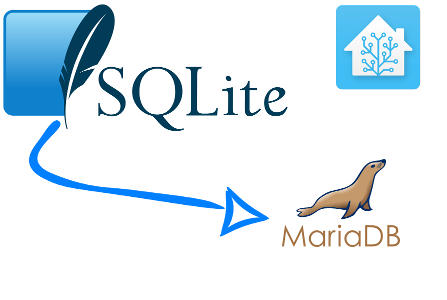 My goal is to get away from the SQLite DB into MariaDB, then easily in the future if I choose a cloud hosted database it’s a simple change. IÂ couldn’t find any specific instructions on how to migrate from sqlite3 for home assistant. Re-configure home-assistant, start and done! The above procedure was found via trial and error and worked for me. Your results may vary, so always save a copy of your sqlitedb in case things go wrong. Full details are below which I carried out with Home-Assistant version 0.38. This should work for future versions as well, though additional fields and constraints may require a few minor adjustments. Annoyingly, the sqlite conversion script doesn’t set auto increment. select max(run_id) from recorder_runs;Â <– This tells you how many IDs you have in recorder runs. Â I had 223.